Yesterday I made Matt a Sunday morning breakfast of Sweet Potato Pancakes using our Sweet Potato Butter. 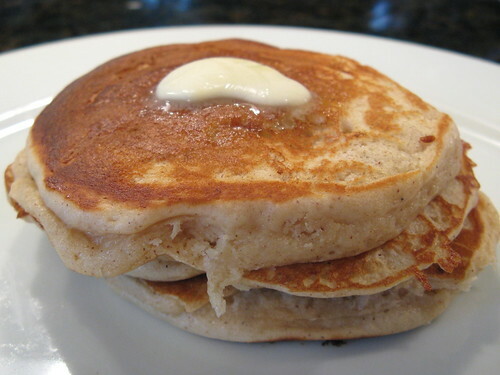 The pancakes came out light & fluffy with a wonderful sweet potato flavor. I found them to be a little richer than our banana pancakes. Matt really liked them with cinnamon infused maple syrup. In a medium bowl whisk the Bisquick, cinnamon & nutmeg together. In another bowl mix together the sweet potato butter, egg, 3/4 c buttermilk & vanilla. Stir this wet mixture into the dry mixture until just blended. If the batter seems to thick add more buttermilk 1 T at a time until you reach the desired consistency. Yes/day while watching Food network, that "secret of food" show was focused on southern food and sweet potato pancakes were making a comeback. Proof is here. Oh my gosh, this is right my alley--something I'd love to dig into! And not just for breakfast, either. yum! Your new nickname is "sweet potata'"!!! They look amazing! I'm a fan of pretty much all pancakes, but the sound of sweet potato ones...oh my. I need to make these! I'm so sad I just used up the last of my bisquick! These look so fluffy and delicious. I'm starting to think that there is nothing you can't do with that sweet potato butter! Oh, yum! What a great way to use the sweet potato butter. Pancakes are one of those foods that you can make in endless varieties and I haven't found a bad one yet. ;) Great idea! I can't believe how fluffy they turned out! Beautiful. what a great idea. it sounds like it'd be very tasty, and healthy too!